Stock # XGEB04752, Intercooled Turbo Diesel V-8 6.7 L/406, Automatic, 72294 mi. Lariat trim. Navigation, Heated Leather Seats, Aluminum Wheels, Trailer Hitch, Back-Up Camera, Premium Sound System, 4x4, Turbo Charged, TRANSMISSION: TORQSHIFT 6-SPEED AUTO.. UNIVERSAL GARAGE DOOR OPENER, CHROME PACKAGE. AND MORE! Leather Seats, 4x4, Back-Up Camera, Premium Sound System, iPod/MP3 Input, Bluetooth, Trailer Hitch, Aluminum Wheels, Dual Zone A/C, WiFi Hotspot, Heated Leather Seats MP3 Player, Keyless Entry, Privacy Glass, Steering Wheel Controls, Electronic Stability Control. 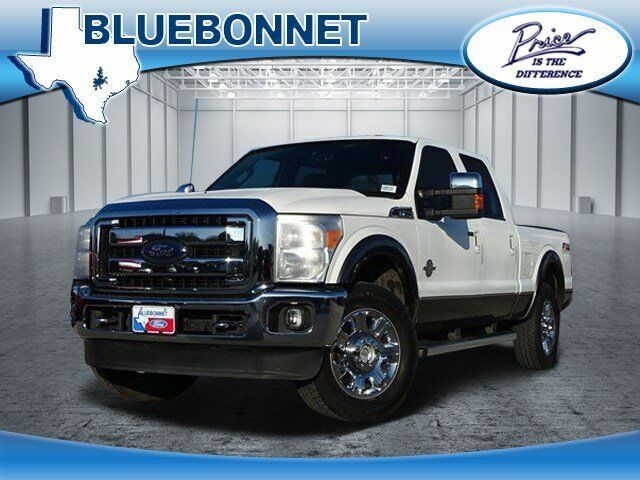 ENGINE: 6.7L POWER STROKE V8 TURBO DIESEL B20 4 valve OHV, manual push-button engine-exhaust braking, turbo gauges and intelligent oil-life monitor, 3.31 Axle Ratio, 26 Gallon Fuel Tank, Dual 78-AH 750 CCA Batteries, CHROME PACKAGE Chrome Exhaust Tip, Wheels: 18" Chrome Clad Cast Aluminum, chrome-clad hub covers/center ornaments, 6" Angular Chrome Step Bars, Unique Chrome Mirror Caps, VOICE-ACTIVATED NAVIGATION HD and satellite broadcast, LARIAT INTERIOR PACKAGE Memory PowerScope Trailer-Tow Mirrors, Remote Start System, Power Heated/Cooled Passenger Seat, Memory Power Heated/Cooled Driver's Seat, easy-entry/exit memory driver's seat feature, Memory Power Adjustable Pedals, ELECTRONIC LOCKING W/3.55 AXLE RATIO, UNIVERSAL GARAGE DOOR OPENER, TRANSMISSION: TORQSHIFT 6-SPEED AUTO W/OD (6.7L) SelectShift, TIRES: LT275/65RX18E BSW A/S (STD).